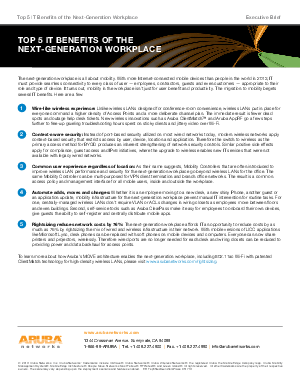 The next-generation workplace is all about mobility. With more Internet-connected mobile devices than people in the world in 2013, IT must provide seamless connectivity to every class of user — employees, contractors, guests and even customers — appropriate to their role and type of device. It turns out, mobility in the workplace isn’t just for user benefit and productivity. The migration to mobility begets several IT benefits.